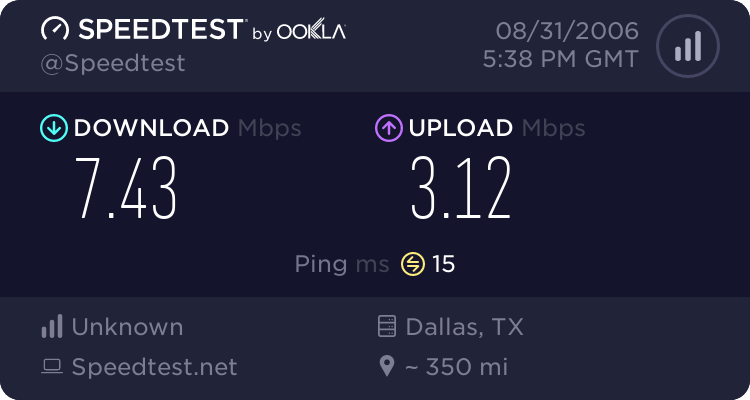 I had forgotten how bizarre satellite scores are when doing bandwidth tests. 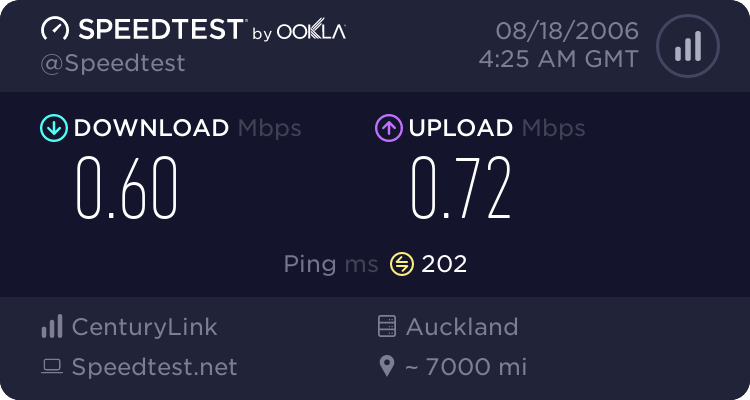 The latency is ATROCIOUS, but once it spools up and buffers a solid stream, the bandwidth isn't that bad. A 512k connection to any website on terra firma isn't too shabby. 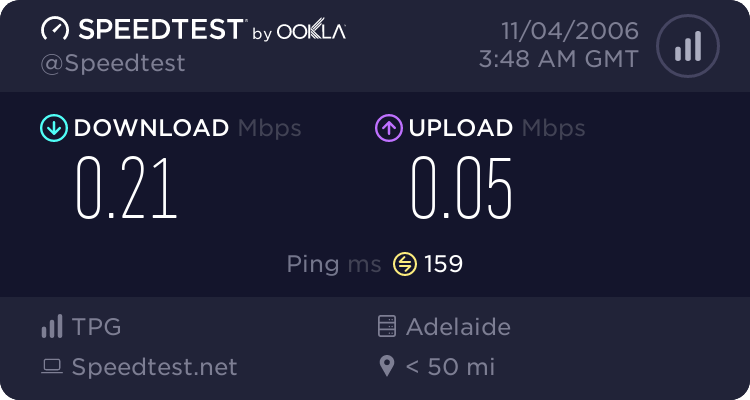 Should be capable of 9mb down but I need to do some tweaking. Are they doing that to everyone? Is it just the higer priced package? 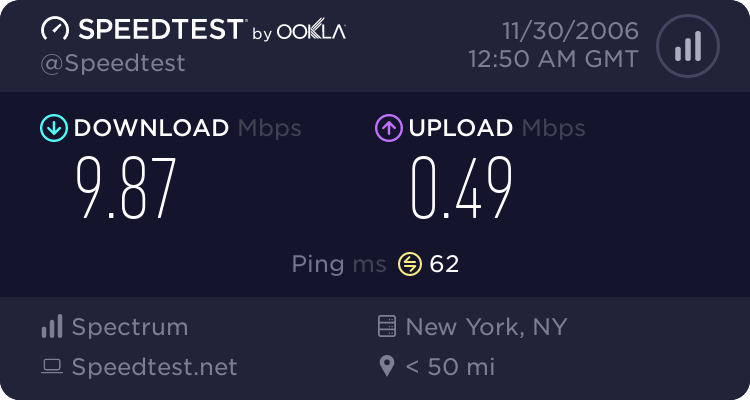 I just got TimeWarner Cable, and I'm still running at 5000/384. 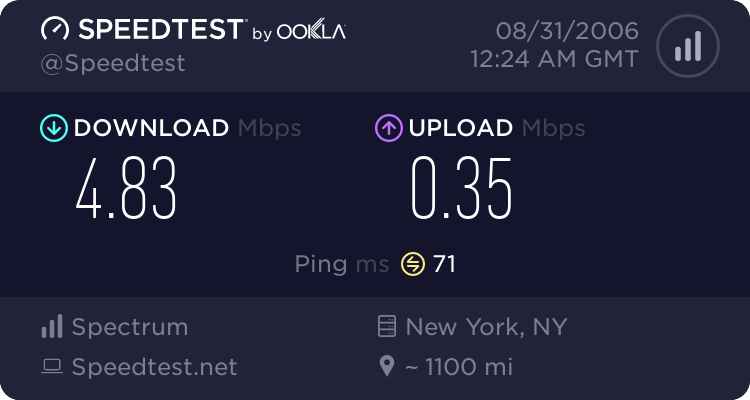 Same question here, I'm running Roadrunner both here and at my parents' house in NY's Saratoga area - both look like they're still running 5000/384. Just moved to a new apartment. 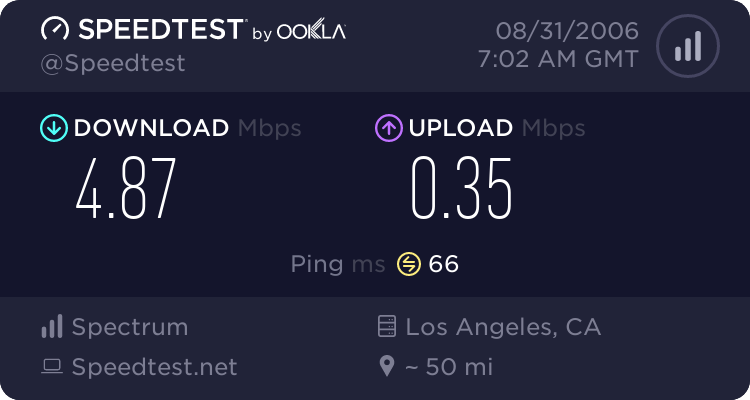 I was scared that my internet would be slow since the internet is included with the rent. But so far, I'm liking the connection here! 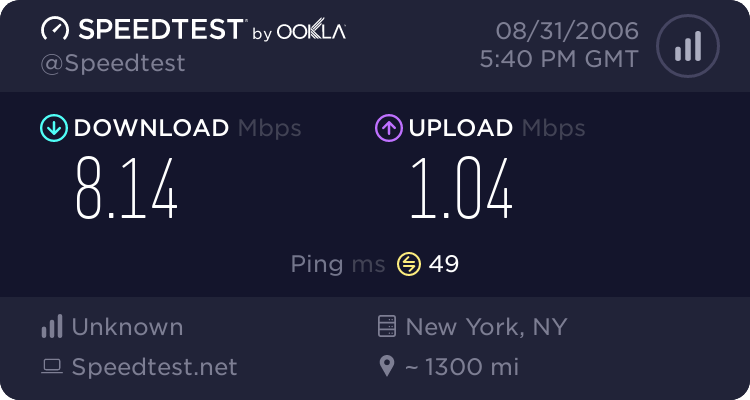 25 Mbps down, 13 Mbps up. Gotta do something about my Comcast connection. Up is always about 370, but down ranges between about 5,700 all the way down to about 250 Kb/s, depending on who-knows-what. 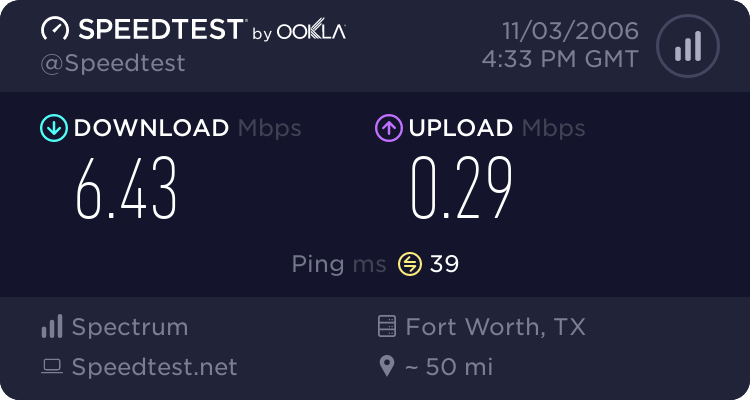 My area just got a download speed boost. 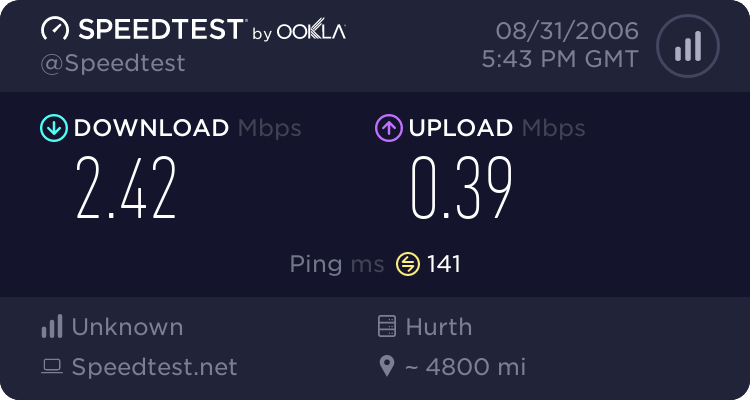 Too bad the upload is still a weak 512kbps. and i'm always running stuff that chogs down the max throughput of my DSL line. Its about $50 Canadian/month. 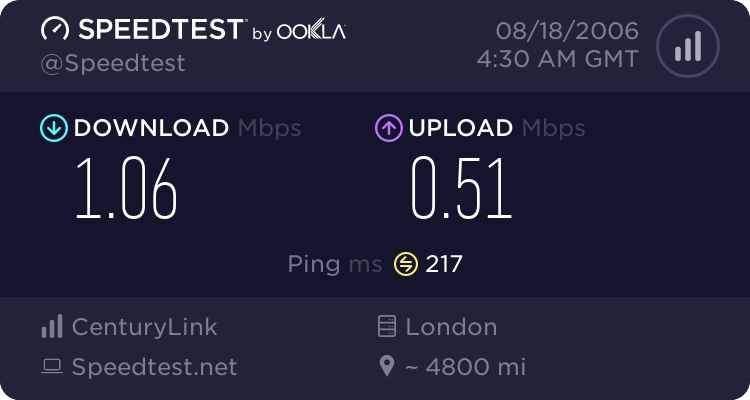 my ISP is primus canada. He's a sad case all around. When I'm paying $20/month more than people getting 30000/5000, yes.